Fund, design, and conduct research projects that address the etiology, spread, and applied management of new and/or important diseases of specialty crops in the Panhandle of Nebraska, with an emphasis on sugar beet, dry bean, and sunflower diseases. 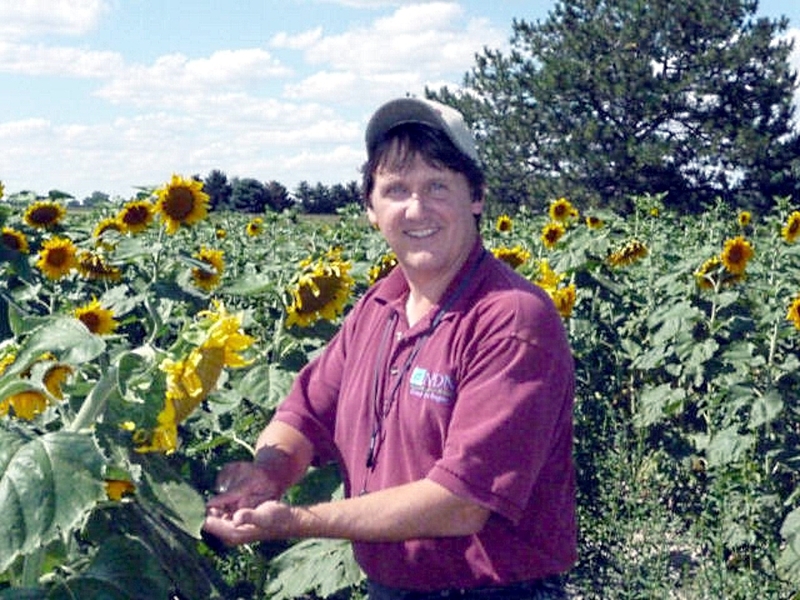 Develop and deliver statewide and regional educational publications and programs involving diseases of specialty crops – including sugar beets, dry beans, sunflowers, potatoes, chickpeas and other pulse crops, proso millet, chicory, grass seed, edible amaranths, bio-fuel crops like brown mustards, camelina, and canola, and other newly emerging alternative crops. 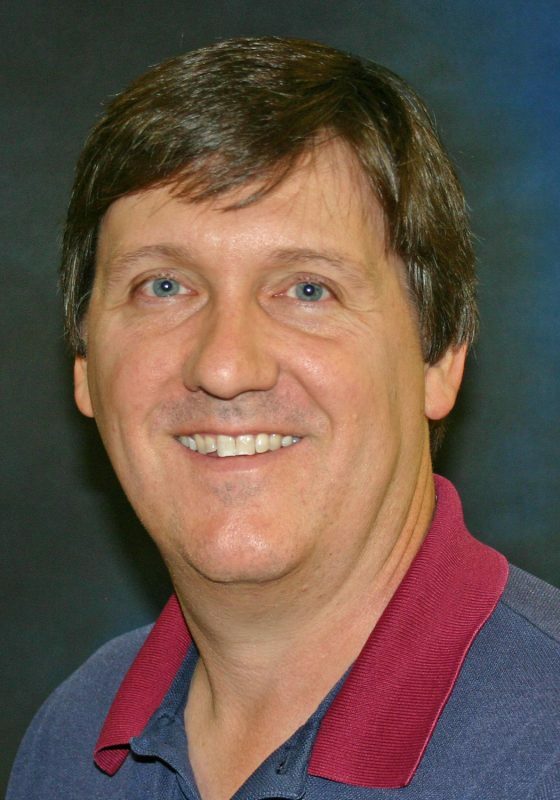 Scottsbluff plant pathology research and extension programs were profiled with individual pages for three European journals dedicated to disseminating information on science, research, and technology. International Innovation, (2014) Issue 164: 96-98; 2) Pan- European Networks, (2015) Issue 14: 207; 3) AG, (2015 (in press). 1. Harveson, R. M. 2010. First Report of Sugar Beet Seedling Rust Caused by Puccinia subnitens in Nebraska. Online. Plant Health Progress. doi:10.1094/PHP-2010-0315-03-BR. 2. Harveson, R. M. 2010. First Report of the Early Spore Stages of Sunflower Rust, Caused by Puccinia helianthi, in Nebraska. Online. Plant Health Progress. doi:10.1094/PHP-2010-0315-01-BR. 3. Harveson, R. M., Steadman, J. R., and Urrea, C. A. 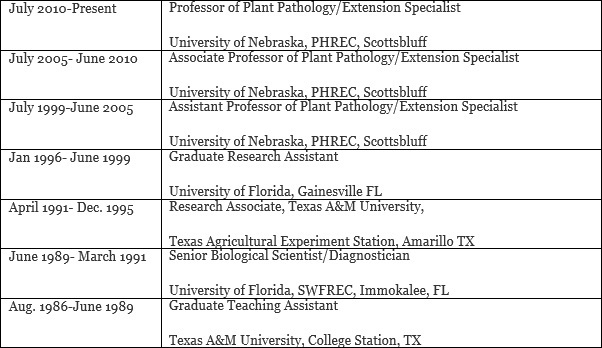 2010 Integrating Planting Dates and Fungicide Applications for Managing White Mold of Dry Beans in western Nebraska. Online. Plant Health Progress: doi: 10.1094/PHP 2010 0701-02-RS. 4. Urrea, C. A., Harveson, R. M., Koehler, A. E., Burgener, P., and Baltensperger, D. D. 2010. Evaluating the Agronomic Potential of Chickpea Germplasm for Western Nebraska. Agron. J. 102: 1179-1185. 5. Harveson, R. M., Markell, S. G., Goswami, R., Urrea, C. A., Burrows, M. E., Dugan, F. Chen, W., and Skoglund, L. G. 2011. Ascochyta blight of chickpeas. Online. Plant Health Progress, doi: 10.1094/PHP-2011-0103-01- DG. 6. Harveson, R. M., Santra, D. k., Putnam. M. L., Curtis, M., and Pavlista, A. D. 2011. A New Report for Downy Mildew [(Hyaloperonospora camelinae Gäum.) of Camelina [Camelina sativa (L.) Crantz] in the High Plains of the United States. Online. Plant Health Progress, doi:10.1094/PHP-2011-1014-01-BR. 7. Skoglund, L. G., Harveson, R. M., Chen, W., Dugan, F., Schwartz, H. F., Markell, S. G., Porter, L., Burrows, M. L., and Goswami, R. 2011. Ascochyta blight of peas. Online. Plant Health Progress doi:10.1094/PHP-2011-0330-01-DG. 8. Urrea, C. A., Baltensperger, D. D., Harveson, R. M., Frickel, G.E., and Koehler, A.E. 2011. Registration of the Chickpea Germplasm PI Bulk with Enhanced Resistance to Ascochyta Blight. J. Plant Registrations 5: 103-108. 9. Agarkova, I.V., Lambrecht, P.A,, Vidaver, A.K., and Harveson, R.M.. 2012. Genetic diversity among Curtobacterium flaccumfaciens pv. flaccumfaciens populations in the American high plains. Can. J. Microbiol. 58:788-801. 10. Delgado, J. A., Goswami, R. S., Harveson, R. M., Urrea, C. A., Beran, D., and Markell, S. G. 2012. First report of Ascochyta blight caused by Qol-resistant isolates of Ascochyta rabiei in chickpea fields of Nebraska and South Dakota. Plant Disease 96:1073. 11. Harveson, R. M. 2012. Sugar beet seedling rust: an uncommon disease with a surprisingly long history. APS Features. doi:10.1094/APSFeature-2012-03. 12. Harveson, R. M., and Bolton, M. B. 2013. First evidence of a binucleate Rhizoctonia as the causal agent of dry rot canker of sugar beet in Nebraska. Plant Dis. 97: 1508. 13. Harveson, R. M. 2013. The multi-colored bacterium. APS Features. doi:10.1094/APSFeature-2013-11. 14. Workneh, F., Henne, D. C., Goolsby, J. A., Crosslin, J. M.,Whipple, S. D., Bradshaw, J. D., Rashed, A., Paetzold, L, Harveson, R. M., and Rush, C. M. 2013. Characterization of Management and Environmental Factors Associated with Regional Variations in Potato Zebra Chip Occurrence. Phytopathology 103:1235-1242. 15. Harveson, R. M. 2014. Puccinia subnitens, a little-known rust pathogen for more than a century. Online. Plant Health Progress. doi:10.1094/PHP-RV-13-1024. 16. Harveson, R. M. 2014. The false root-knot nematode: a unique plant pathogen native to the western hemisphere. APS Features. 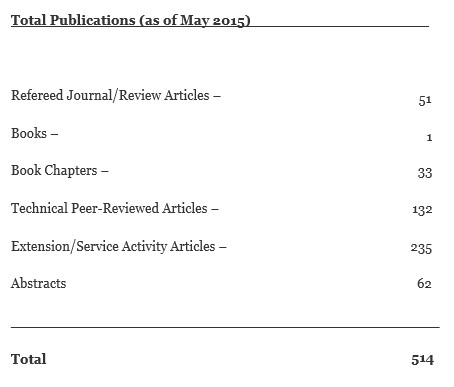 doi:10.1094/APSFeature-2014-06. 17. Harveson, R. M., Nielsen, K. A., and Eskridge, K. M. 2014. Utilizing a pre-plant soil test for predicting and estimating root rot severity in sugar beets in the Central High Plains of the U.S. Plant Dis. 98: 1248-1252. 18. Urrea, C. A. and Harveson, R. M. 2014. Identification of sources of bacterial wilt resistance in common beans (Phaseolus vulgaris L.) Plant Dis. 98: 973-976. 19. E. C. Heitkamp, E, C., Lamppa, R. S., Lambrecht, P. A. Harveson, R. M. Mathew, F. M., and Markell, S. G. 2014. First Report of Bacterial Pustule on Soybeans in North Dakota. Online, Plant Health Progress. doi:10.1094/PHP-BR-14-0007. 20. Friskop, A. J., Gulya, T. J., Harveson, R., H., Humann, R. M., Acevedo, M., and Markell, S. G. 2015. Phenotypic Diversity of Puccinia helianthi (Sunflower Rust) in the United States from 2011 and 2012. Plant Disease 99: (In Press). 21. Harveson, R. M. 2015. Beet curly top, America’s first serious sugar beet disease. APS Features. doi:10.1094/APSFeature-2015-02. 22. Webb, K. M., Harveson, R. M., and West, M. S. 2015. Evaluation of Rhizoctonia zeae as a potential biological control option for fungal root diseases of sugar beet. Ann. Appl. Biol. (In Press). 23. Harveson, R. M., Schwartz, H., F., Urrea, C. A., and Yonts, C. D. 2015. Bacterial wilt of dry beans: past, present, and future. Plant Dis. 99: (In review).